Sonitrol Western Canada's verified audio intrusion systems have given clients the fastest possible response time due to our unique sound detection technology. Whenever our sensors pick up abnormal activity on your premises, a signal is sent to our Central Monitoring Centre and expert operators listen to live audio transmissions from your site. Once the alarm is verified, they immediately call the proper authorities or if no threat exists, reset your system without disturbing you or officials. Sonitrol’s verified audio intrusion detection system goes beyond the status quo in the security industry and it’s one of the most powerful tools you can add to protecting your thriving business. Sonitrol’s verified audio intrusion detection system is one of the most powerful tools you can add to your security arsenal – and it’s unique in the marketplace. 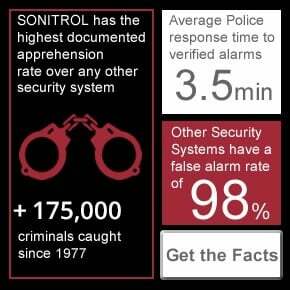 Unlike conventional alarms, Sonitrol’s verified alarms are sound-based – not motion-based – so when an alarm is triggered, our monitoring professionals can actually listen-in to determine whether a break-in is in progress, or whether a false alarm has occurred. If it is a break-in, we immediately dispatch police and relay real-time information to the responding officers. If it is a false alarm, we simply reset the system without bothering you or the police. What makes verified audio intrusion detection so unique? Sonitrol strategically places small audio sensors throughout your business premises, allowing us to hear the sounds of abnormal activity as they occur in your facility. The sounds of the break-in attempt and a code describing the location of the activated audio sensor are transmitted immediately when the audio surveillance system is activated, and are then sent to our central monitoring station. 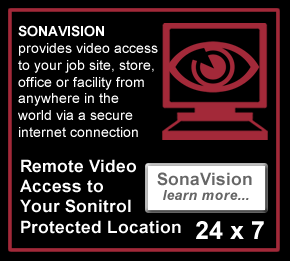 Once a security event is in motion, a professionally trained Sonitrol operator silently listens to live audio from your facility, while pertinent customer data is displayed on a computer screen for the operator to review and report. Professional operators on duty 24-hours a day, 7 days a week, can determine and verify the nature of the break-in sounds and take immediate action as needed the moment an alarm is triggered and tell-tale sounds of a break-in attempt are transmitted to the Sonitrol monitoring station. The ability to verify each audio activation is key to our success. This unique combination of technology and industry leading audio and video monitoring renders false alarms nearly extinct, and has earned Sonitrol the trust of police and fire officials literally across the continent. Sonitrol Western Canada's audio detection security system provides complete protection for businesses and homes in the Vancouver, Victoria, Surrey, Calgary, Burnaby, Edmonton, Saskatoon and Regina metropolitan areas. Unlike traditional burglar alarms, our audio sensors do more than detect motion; our monitoring center actually hears activity at your site. Unlike a traditional burglar alarm with motion sensors that only detect what is right in front of them, Sonitrol Western Canada's audio sensor technology provides complete 100% wall-to-wall, floor-to-ceiling coverage. With our early detection, verification and 100% coverage, Sonitrol Western Canada makes it easy for you to protect your facility. We deliver true peace of mind with our guaranteed Commitment to Service.